MDLIVE, the nation's leader in the rapidly growing virtual health market, today announced a further expansion of its collaboration with Walgreens. The agreement adds access to behavioral health services provided by Breakthrough, an MDLIVE company. Through Walgreens, MDLIVE offers 24/7 access to board-certified, primary-care doctors and pediatricians via online video, mobile app, or phone. With MDLIVE's HIPAA-compliant cloud-based Virtual Medical Office platform, consumers have a more convenient way to see a doctor for non-emergency health issues—anywhere, and anytime—whether at home, at work, or while traveling. 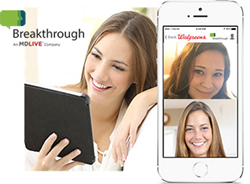 With the addition of Breakthrough, an MDLIVE company, Walgreens consumers will now also have access to more than 1,000 licensed therapists nationwide to schedule secure video sessions by appointment. The collaboration between MDLIVE and Walgreens first launched in December 2014. “Access to providers and care is one of the biggest challenges for our mental health system today, and we’re pleased to work with MDLIVE to help meet this need as part of the Walgreens mental health platform,” said Adam Pellegrini, Walgreens divisional vice president of digital health.